Enter the Gungeon launched three years ago on April 5, and to mark the occasion, it's getting one last update so it can go out with a bang. A Farewell to Arms will arrive on the anniversary, introducing two new characters, another floor, a new boss and more. The Paradox is a randomised Gungeoneer, while the Gunslinger begins the game with a wild starting item. They'll be accompanied by dozens of new guns and items, along with a new secret floor and, at the end, a new boss waiting to be filled with holes. You'll encounter a new NPC, too. Bowler will introduce you to a new mode inspired by the community. 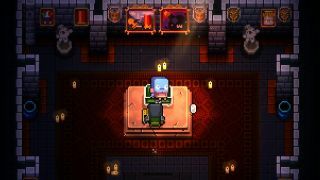 At the beginning of each run of Rainbow Mode, you'll be able to loot a chest and take one gun and item, and they are all you'll get, aside from pick-ups and Master Rounds, for the entire run. Developer Dodge Roll games wanted to release the last update for everyone, rather than putting it all in some DLC, so you can get the lot for free. It's larger than was initially planned, too, which is why it's launching next month instead of last year.